Catopuma is a genus containing two Asian small wild cat species, the Asian golden cat (C. temminckii) and the bay cat (C. badia). Both are typically reddish brown in colour, with darker markings on the head. The two species diverged from one another 4.9-5.3 million years ago, long before Borneo separated from the neighboring islands. 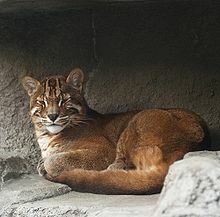 Their closest living relative is the marbled cat (Pardofelis marmorata), from which the common ancestor of the genus Catopuma diverged around 9.4 million years ago. ^ a b Kitchener, A. C.; Breitenmoser-Würsten, C.; Eizirik, E.; Gentry, A.; Werdelin, L.; Wilting, A.; Yamaguchi, N.; Abramov, A. V.; Christiansen, P.; Driscoll, C.; Duckworth, J. W.; Johnson, W.; Luo, S.-J. ; Meijaard, E.; O’Donoghue, P.; Sanderson, J.; Seymour, K.; Bruford, M.; Groves, C.; Hoffmann, M.; Nowell, K.; Timmons, Z.; Tobe, S. (2017). "A revised taxonomy of the Felidae: The final report of the Cat Classification Task Force of the IUCN Cat Specialist Group" (PDF). Cat News (Special Issue 11): 36−37. ^ Vigors, N. A.; Horsfield, T. (1827). "Descriptions of two species of the genus Felis, in the collections of the Zoological Society". The Zoological Journal. III (11): 449–451. ^ Hodgson, B. H. (1831). "Some Account of a new Species of Felis". Gleanings in Science. III (30): 177–178. ^ Johnson, W. E.; Ashiki, F. S.; Menotti Raymond, M.; Driscoll, C.; Leh, C.; Sunquist, M.; Johnston, L.; Bush, M.; Wildt, D.; Yuhki, N.; O'Brien, S. J. & Wasse, S. P. (1999). "Molecular genetic characterization of two insular Asian cat species, Bornean Bay cat and Iriomote cat". In Vasser, S. P. Evolutionary Theory and Process: Modern perspectives. Papers in Honour of Eviatar Nevo. Dordrecht: Kluwer Academic Publishing. pp. 223–248. ISBN 9780792355182. ^ Johnson, W. E.; Eizirik, E.; Pecon-Slattery, J.; Murphy, W. J.; Antunes, A.; Teeling, E.; O'Brien, S. J. (2006). "The Late Miocene Radiation of Modern Felidae: A Genetic Assessment" (PDF). Science. 311 (5757): 73–77. doi:10.1126/science.1122277. PMID 16400146.